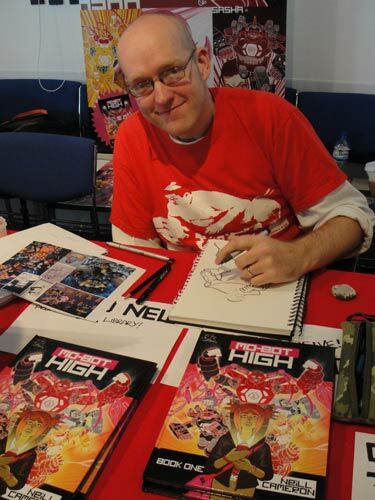 I spent this weekend at the British International Comics Show in Birmingham, and a very enjoyable time it was too. 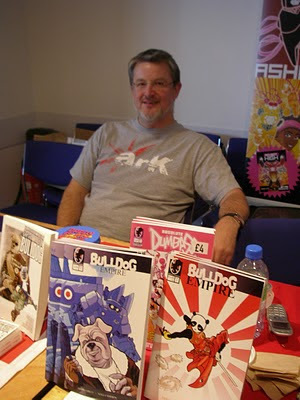 A large part of this was down to the fact that I was sharing a table with my longtime comics compadre and Bulldog: Empire co-creator Jason Cobley, and a nicer chap to spend a couple of days with hanging out and chatting about comics you would be very hard-pressed to meet. 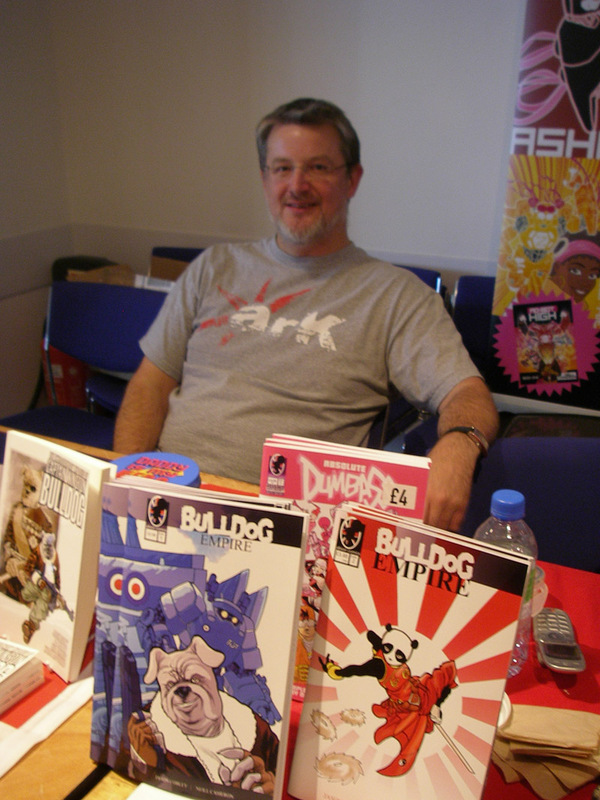 Jason was selling his brand-new anthology Bulldog Clips, which marks the return to comics after a brief leave-of-absence of his creation Captain Winston Bulldog, the longest running character in British small press comics! I think Jason was only planning for Clips to be a one-off, but the response to it was so positive that hopefully it might now become a regular event. I have already volunteered my services for the next issue! Anyway, the main reason I was at BICS was to try and sell some exclusive pre-release copies of Mo-Bot High, and I'm happy to report that I was successful in this, and indeed managed to TOTALLY SELL OUT! Which made me very happy, not least because hardback books are actually pretty heavy, as it turns out, and I was really hoping I wouldn't have to carry them all home. The star of Mo-Bot High Book Two? If he gets his way, anyway. That's Finn, who bought a copy of the book on the Saturday and then came running back up to the table on Sunday demanding "I WANT BOOK TWO! NOW!!!" Which was gratifying, but as I told him, he should really pass that on to my publisher. Finn kept popping back over the rest of the day to ask me more and more detailed and highly observant questions about the specifics of how mo-bots work, the different modes, certain SPOILER-FILLED aspects of the storyline, etc - and to demand a starring role in Book Two. 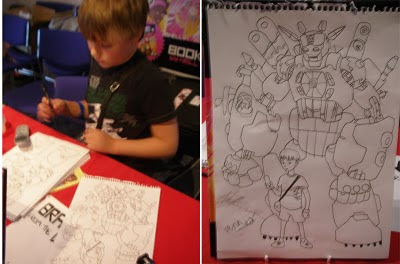 He ended up making himself so comfortable behind our table - and was so enthusiastic in his efforts at trying to get other passers-by to "BUY THIS BOOK IT'S AWESOME" - that I only found out at the end of the day that a lot of my fellow con-goers had assumed he was my own kid. Nope, just a satisfied customer! Also: Nigel Dobbyn. But he was so awesome he gets a whole blog post to himself. Coming tomorrow! So yeah, given that I was a bit apprehensive of how the event would go, I ended up having a really good time at BICS, and as my first attempt at launching Mo-Bot High onto an unsuspecting world it went really pretty well. Did I mention I TOTALLY SOLD OUT? I was one of those who was sure Finn was Neill's son, to the point where I'd actually convinced myself I could spot small points of family resemblance. 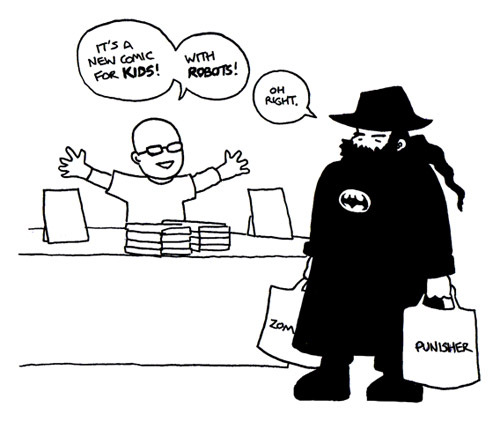 His patter totally sold Mo-Bot High to me, and I'd already read most of it! Finn, if you're reading this, I've got comics for you that I want your opinion on. I'm serious, get in touch! This post is very nice, Because your post is giving very nice information. So we are very thankful to you. Last night Finn, his sister and their friends had a colouring competition using photocopies of his Mo-Bot page. I hope that the increased sales you may have got from his enthusiasm were worth the pestering. Dave - I've sent you an email. Wake - that's great to hear! Hey, on the mo-bot high website (www.mobot-high.com) there's a 'how to draw a mo-bot' sheet, and I'm going to try and add a bunch more stuff like that up there soon. It is Mo-Bot High Day! Let us celebrate! How To Draw Comics The Neill Cameron Way!